Il mulinello da casting Daiwa Prorex XR è la scelta migliore per andare con grandi esche a caccia di pedatori quali luccio e big bass con swimbaits. Questo taglia 300 offre il giusto equilibrio per l'utilizzo delle potenti canne Prorex baitcasting e la gestione di esche pesanti. Costruito in alluminio il Prorex XR è sinonimo di resistenza e robustezza nonchè di leggerezza, 295 grammi che vi permetteranno di pescare per ore. Dotato di 6 cuscinetti a sfera CRBB, altamente resistenti alla corrosione. La loro resistenza e durata sono 10 volte superiori a quelle dei cuscinetti standard. Questo mulinello baitcasting ha anche un freno magnetico Mag Force. Durante le varie fasi di lancio, questo freno regola efficacemente l'intensità magnetica. Manovella sinistra. At modern spin fishing for predators baitcasting reels offer many advantages compared to fixed spool reels, since especially at the use of heavy baits they provide better lure control and retrieving power. The Prorex baitcasting reels are the perfect solution for predator hunting! 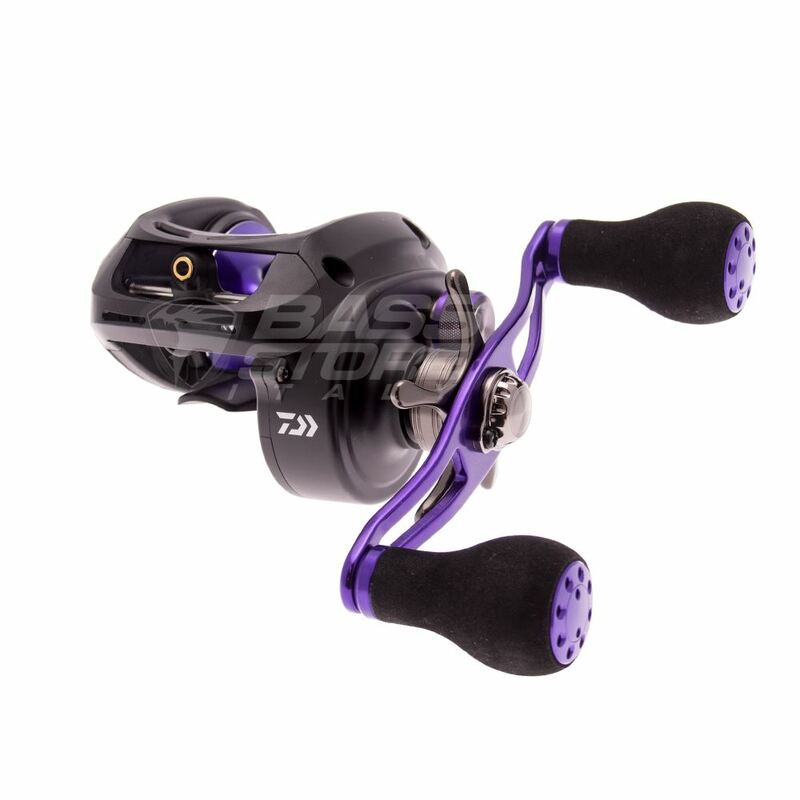 An aluminum frame cares for an optimal and thus distortion-proof storage of the gearing for high retrieving power during the fight while the 5 ball bearings care for a silky-smooth running and longest casting distances. The Magforce drag system offers highest security at casting and supports the casting performance. High transmission rates of 7.3:1 (#100) or 6.3:1 (#200) enable the application of nearly all modern styles of lure presentation. The ATD drag system delivers a constant drag power and eliminates the usual higher starting resistance. 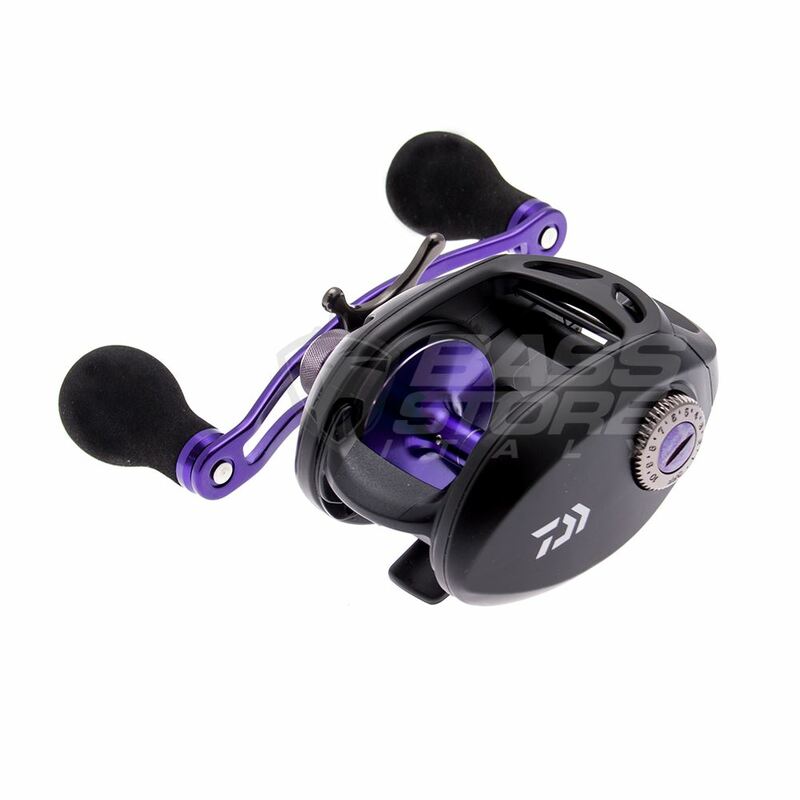 Thanks to the extra-large handle knob and the long handle this reel is convenient to operate and offer a higher retrieving power. Both sizes are available as left hand and right hand version. DAIWA PROREX BAITCAST Baitcastrolle mit Magforce Magnetbremse Die Daiwa Prorex XR Baitcast Rolle ist eine optimale Wahl, um mit größeren und großen Kunstködern auf die Raubfischjagd zu gehen. Der große 300er Rahmen bietet dabei eine sehr gute Balance beim Einsatz mit kräftigen Baitcast-Ruten. Durch die große Schnurkapazität kann die Rolle auch problemlos mit dicken geflochtenen Schnüren gefischt werden, um sich mit Großfischen in unseren Gewässern anzulegen. Der Aluminium-Rahmen bietet eine verwindungsfeste Lagerung des Getriebes und sorgt für eine starke Einholkraft im Drill.